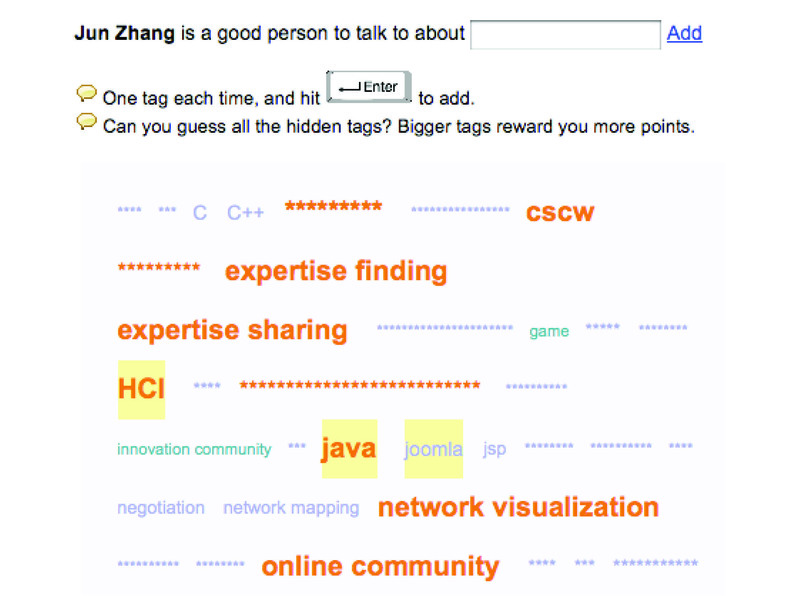 Researcher Jun Zhang and colleagues designed a social game to engage people in contributing to expertise profiling for themselves and their colleagues. In „Expertise­Tagging Game: Identifying Expertise Networks in organizations“ (2007) they describe how it works and a pilot study. Playing the game a user gets certain points when his or her input matches with other users’ input. Thinking about our newly launched expertise finder system UCSF Profiles, a ‘game’ approach might be an interesting idea to explore. UCSF Profiles builds on a good set of data retrieved from Pubmed and already allows passive networks based on that information. However, active networking mechanisms will be helpful to retrieve ‘local knowledge’ that goes beyond scientific publications. By the way, some senior users expressed concerns of deploying a game into a corporate environment, so the authors repositioned the ‘game’ as a “system for people to recognize their colleagues by recommending their expertise using tagging as well a means of self-expression by self-tagging and approving peers’ tags”. And while we are at it, here is a second one: “The Dogear Game” (2007). Individual players receive entertainment and learn about their colleagues’ bookmarks. The player’s colleagues, on the other hand, receive recommendations of websites and documents of potential interest to them. The numbers are impressive: The game was implemented as a plug-in to a corporate instant messaging client used by over 100,000 employees. Read on.